Now You Can Claim a Prize Just For Entering! Our goal is helping keep you and your family safe, especially during emergencies. 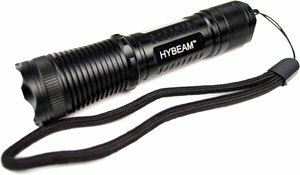 Get Your FREE Hybeam Super Bright Military Grade Flashlight! It fits in your pocket or purse & is an essential tool in an emergency… And today it’s yours free! This high-quality & super bright flashlight will come in handy in all kinds of situations. There’s a limited supply, so take action before they’re gone. Help Spread The Word About The Contest & Earn Bonus Entries & Greatly Increase Your Chance To Win A Grand Prize! Share your special Contest Link so that others can join. You’ll earn bonus points when people join through your link. Once you’re earning points watch our Facebook page to see if you win our bonus draws. Watch your email inbox to learn about new ways to earn extra contest points. We reserve the right to adjust this list, adjust your points or ban you from the contest for using spammy tactics to promote the contest. If you are found to be using any automated means of producing traffic or sign-ups you will be banned immediately. If you are caught signing up under false accounts to inflate your points you will be banned immediately. No purchase necessary, void where prohibited. Contest rules subject to change without notice. See contest rules for more information.